Supported by a local Friends chapter and located near the northern edge of the mysterious Okefenokee Swamp, this park is home to many fascinating creatures and plants, including alligators and carnivorous pitcher plants. Walking or biking along the lake’s edge and nature trail, visitors may spot the shy gopher tortoise, numerous oak varieties, saw palmettos, yellow shafted flickers, warblers, owls and great blue herons. The park’s lake offers opportunities for fishing, skiing and boating, and canoes and bicycles are available for rent. The Lakes, a championship 18-hole golf course, features a clubhouse, golf pro and junior/senior rates. Greens are undulating rather than tiered. Each fairway and landing area is defined with gentle, links-style mounds that accent the course’s three large lakes. The park’s namesake was a Georgia writer, teacher, civic leader and naturalist who loved trees and worked for their preservation. 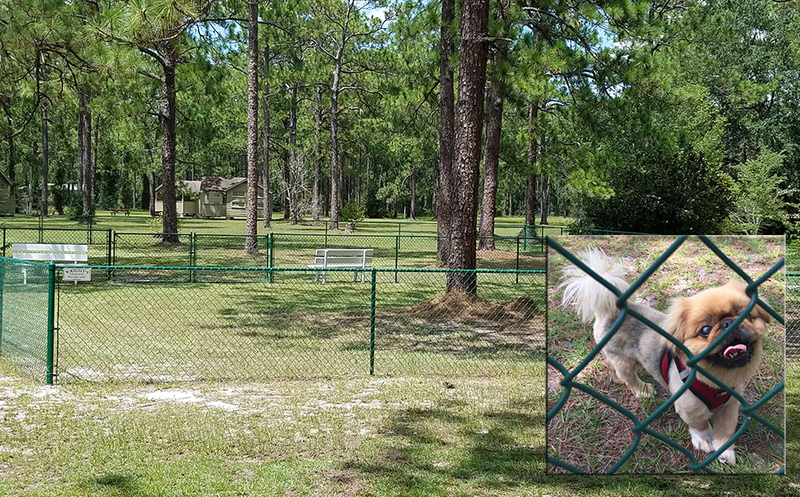 After many hours of fundraising, planning and installing, Friends of Laura Walker State Park completed the final stage of the park's first ever dog park! The process was long but they are very happy with the results and think that you and your furry friends will enjoy as well. For a full listing of events and information about Laura S. Walker State Park Historic Park visit the Georgia State Parks page.